The Board of Directors will hold a public meeting on Friday, April 25, 2014, at 7:30 p.m. at the Alice School House to discuss the status of the water system. As of April 21, 2014, the District system has seen much improvement. The water level in the wells are increasing daily at a promising rate. The pressures have reached the normal operating levels. We are currently hyper-chlorinating the system as per State of Colorado Rules and Regulations. If the system continues to stabilize, we will be flushing/scouring the entire system on April 23, 2014, charging up booster stations, and testing. Lab results are usually completed in 24 hours of the lab receiving the test. If the District passes with lab results in compliance, the Operator will give us approval to reactivate the system and notify customers they can use the water. The flushing procedures are attached below. While the District is flushing/scouring the system, it is important that customers do not use water. It is important that the District have as much water as possible to complete this process. If customers use the water, this may delay the process and delay the date of being able to bring the system up for customers to begin using the water. Please note you can use the sewer system and use the potable water available in the lower parking lot of the condos to fill your toilet tanks for flushing. You will be notified when you can use the water. You will see that you may have water service during the flushing process, please do not use any water until you are advised you may do so. 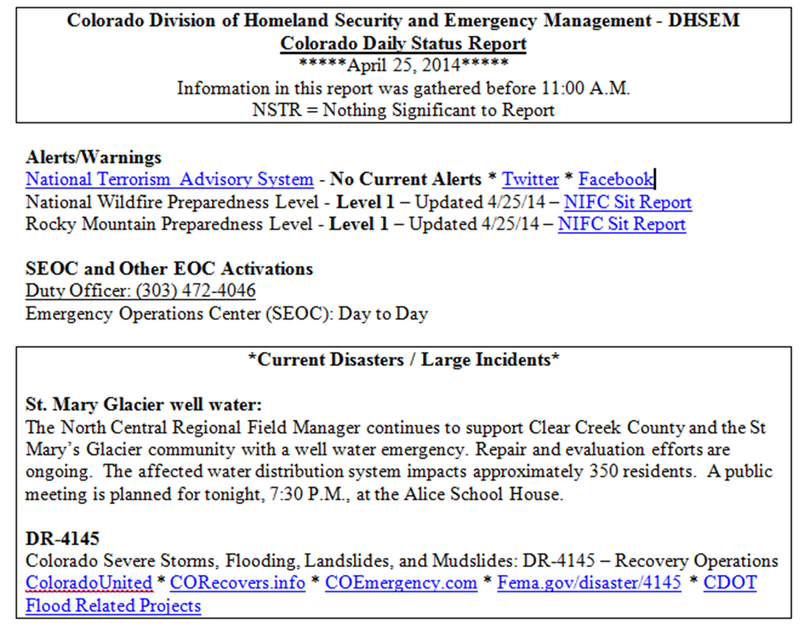 We are working in cooperation with the State of Colorado, Clear Creek County, The Department of Health, and, Ramey Environmental Compliance, LLC in resolving this situation as quickly as possible and to develop a plan to reduce the potential for future occurrences. 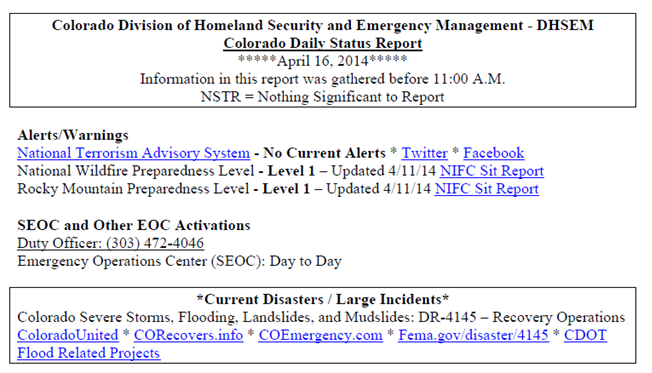 View or download the full Colorado Daily Status Report for April 24, 2014. 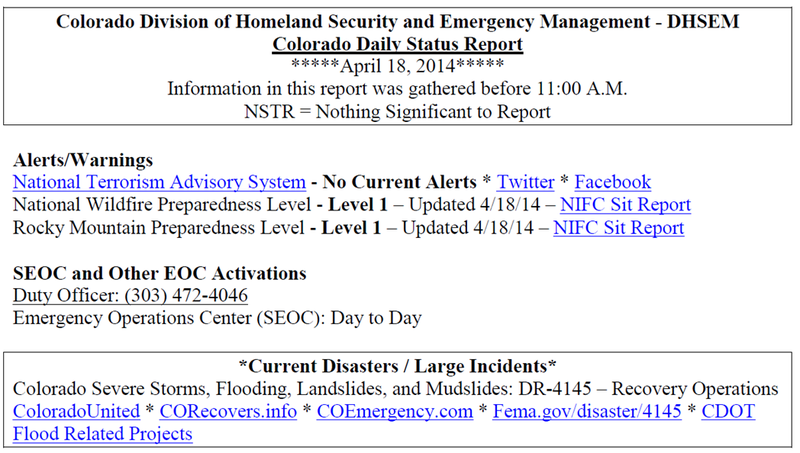 View or download the full Colorado Daily Status Report for April 16, 2014. 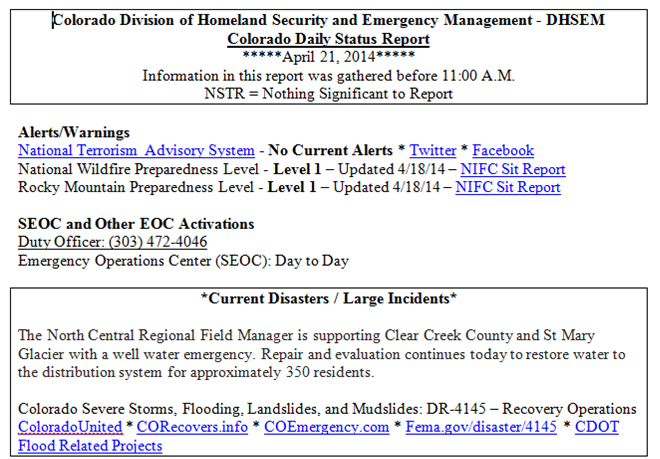 As we saw last September flooding can be a major problem in Colorado. 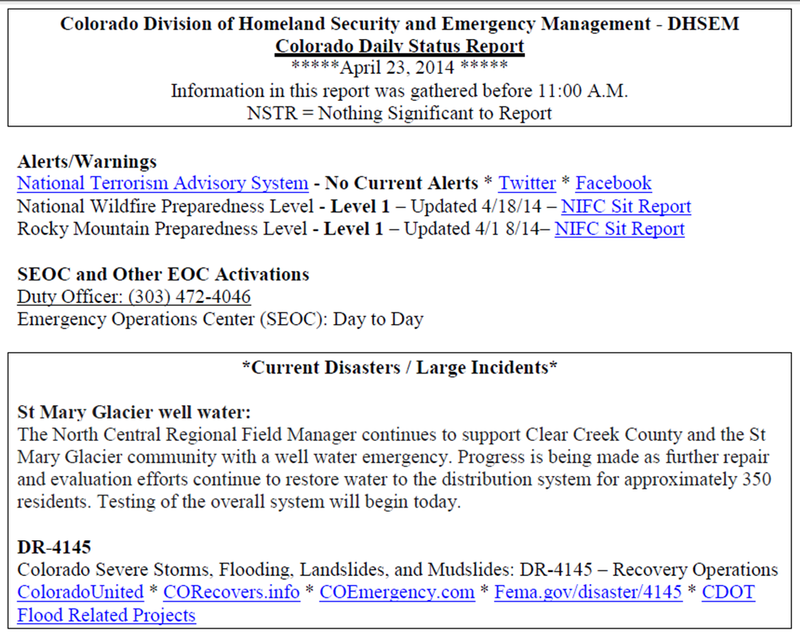 The flash flooding in September damaged a number of streams and mitigation is ongoing to remove debris and shore up heavily damaged areas along the streams in and near the foothills from Larimer County to El Paso County. 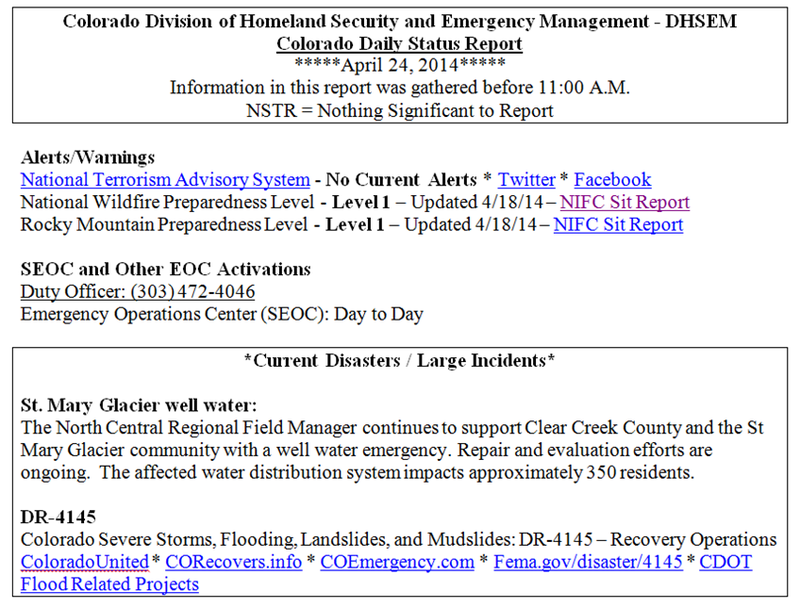 The snowpack in the South Platte Basin is above normal so there is concern when the melt occurs that streams may not be able to handle a fast melt. The rate at which runoff occurs is dependent on a number of factors including the depth of the snow, how fast hot temperatures develop and whether thunderstorms drop heavy rain on the snowpack with runoff combining with falling rain. In 2011 we had a similar high snowpack with minimal flood issues as the warm days and cool nights moderated the rate of the snow melt. 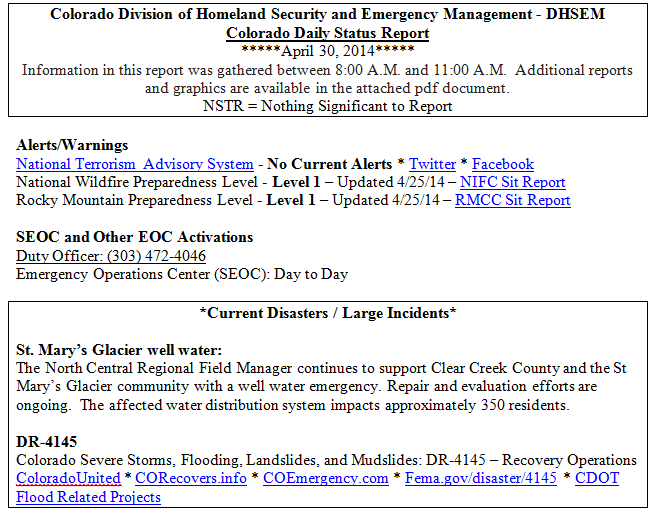 The peak snowmelt season is usually extends from late May through early June. In September over eight inches of rain fell over a large area of the foothills from northern Jefferson to northern Larimer counties. All this rain filled area creeks and rivers causing considerable flash flooding. Runoff from area streams combined to cause major flooding along the South Platte River. Flash flooding refers to dangerous sudden rise in water along a creek, river or over a normally dry land area. Flash floods result from heavy rainfall, sudden breaks in river ice jams and dam or levee failures. Flash floods can occur within a few minutes or hours and can move at surprisingly high speeds, striking with little warning. Flash floods are quite destructive because of the force of the moving water and the debris that accumulates in flood waters such as trees and boulders which can destroy roadways, bridges and buildings. Other complications in Colorado are recent fires which raise the flood threat when locally heavy rain falls on recently burn scars. 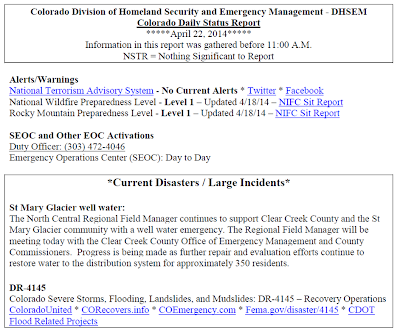 Residents in and near burned areas near Mancos, Debeque or in the Front Range Foothills from Larimer to El Paso Counties should plan ahead on response actions for flooding. A flash flood or flood watch which means that flash flooding or flooding is possible within the watch area. A flood warning which means that flooding is imminent or has been reported along a river. A flash flood warning which means that flash flooding has been reported or is imminent. When a flash flood warning is issued for your area act quickly. If advised to evacuate do so immediately. Go to higher ground or climb to safety before access is cut off by flood waters. An urban flood advisory will be issued for impact flooding that is not in itself life threatening. In an urban area if you were commuting during rush hour during a flood advisory you could expect some intersections to be underwater and a much longer commute. A small stream flood advisory might be issued when flow is bankful with minor lowland flooding along the stream. Nearly half of all flash flood fatalities are vehicle related. Do not enter a flooded roadway, instead turn around, do not drown. In rapidly rising waters backing up away from water may be safer. One to two feet of water will carry away most vehicles and you also cannot tell if the road is damaged beneath moving water. Colorado Severe Weather Awareness Week continues through this Saturday. 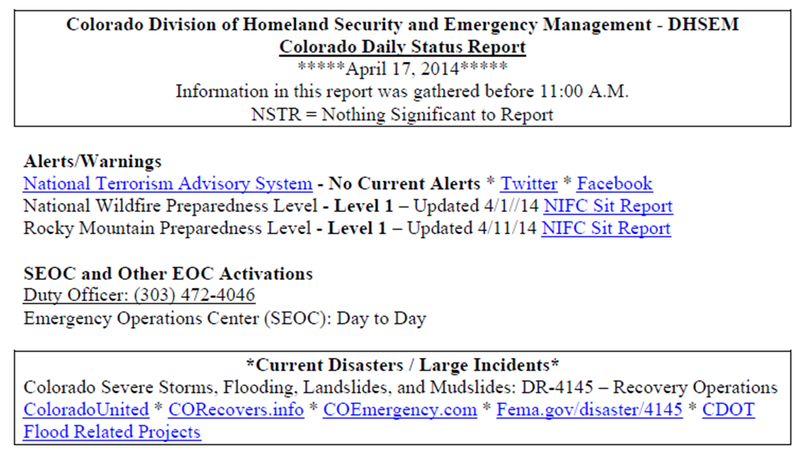 View or download the complete Colorado Daily Status Report for April 14, 2014. The National Weather Service sees the potential for severe weather and a stream of weather information flows from the National Weather Service forecast offices to you. Each National Weather Service forecast office has a web site, a facebook page and a twitter feed where you can find graphical weather stories which highlight upcoming weather hazards. The Hazardous Weather Outlook, a text product, it is also available which highlights weather hazards sometimes seven days in advance. The Storm Prediction Center in Norman, Oklahoma also forecasts the chance for severe weather across the country several days in advance. These outlooks will tell you if there is a chance for severe weather and if you are in a slight risk, moderate risk or high risk area for severe weather. If severe weather becomes likely within six hours a watch will be issued alerting you to the increased risk for severe weather. If you are in or close to the watch area you should plan where to go for shelter if severe weather occurs. If high wind is a threat tying down or bringing loose objects indoors would be a wise move. If large hail is a threat protecting your vehicle would be a good idea. Then forecasters at the local National Weather Service office will monitor satellite and radar data and collaborate with severe weather spotters. Forecasters will issue warnings to alert you of the imminent severe weather threat. The warnings are sent out in many different ways in order to reach the most people possible. A severe thunderstorm warning is issued for wind gusts of 58 MPH or higher or for hail one inch in diameter or larger. Before and during severe weather you can receive watches, warnings and advisories on NOAA all hazards weather radio. Most weather radio receivers have a built in tone alert which is activated by the national weather service when watches and warnings are issued. You will also see warnings on the internet, your smartphone with wireless emergency alert (WEA) messages or hear them on your local radio or television stations. Do not be caught off guard. Know how to receive watch and warning information and know what to do when severe weather threatens. 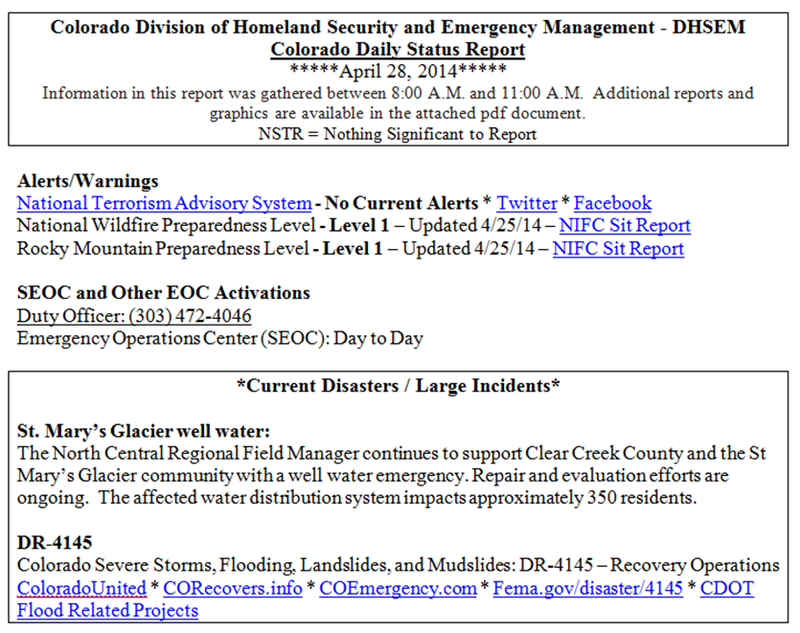 Specific safety information will be available each day of this Colorado Severe Weather Awareness Week. This guest blog written by Tom Magnuson, Warning Coordination Meteorologist, National Weather Service, Pueblo, Colorado.